The process of removing divalent cat ions, usually calcium or magnesium, from water. When a sample of water contains more than 120 mg of these ions per liter, expressed in terms of calcium carbonate (CaCO3), it is generally classified as a hard water. With years of experience in the domain, we offer our customers a huge assortment of Water Softening Equipment. It removes the dissolved harmful mineral from water and makes it fit for drinking and other purposes. We are the leading and prominent Manufacturer and Exporter of Water Softeners. We have been able to offer a broad range of Water Softener. The given product finds its application in both domestic and commercial sectors and is widely used to convert hard, undrinkable water into clean potable water. Our skilled professionals utilize best quality components and advanced technology which is in compliance with the industrial norms to design these water softeners. Our products are also checked on several pre-defined parameters to ensure their flawlessness. Further, customers can get these at a rock-bottom price. Since the inception of our company, we are engaged in providing a comprehensive array of Softener System. The offered softener system is used to treat contaminated water into the pure and safe water which is suitable for consuming. The given product is reckoned in the market for its high strength, compact dimension, extended durability, and non-corrosive nature. Our dexterous professionals precisely engineer the product by making use of best quality components, and latest cut edge technology which is in tune with the industry laid standards. 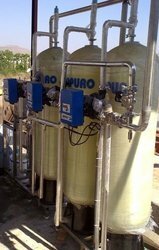 Aguapuro offers Water Softening Plants FRP in various sizes ranging from 200 ltrs/hr up to 544 m3/hr and above. These units are available in FRP option. 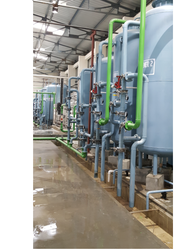 These water softening equipments are manufacture using FRP pressure vessel, internal distribution and collection system, multiport or individual valves, piping, ventury for salt injection, salt tank, test kit etc. We offers poly styrene di-vinyl benzene (resin) of either ion exchange make or lanxess make for better water quality. Treated water quality at the outlet of the unit is having hardness less than 5 ppm (commercial zero). These systems are available from 200 mm diameter upto 1600 mm diameter and more as well. Softeners are also available with Pre Filtration system and Feed Pumps. 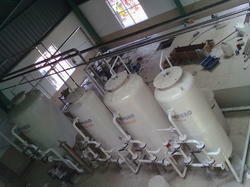 Stainless Steel Water Softeners Auto works for 500 m3/hr and above. These units are available in stainless steel option. Units are manufactures using stainless steel pressure vessel, internal distribution and collection system, multiport or individual valves, piping, century for salt injection, salt tank, test kit etc. These softeners are available with auto multiport valves (either top or side mounted) or auto pneumatic actuated valve. 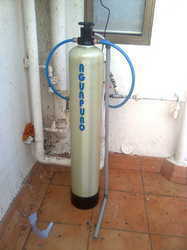 Aguapuro offers water softener in various sizes ranging from 1 m3/hr upto 900 m3/hr and above. Mild Steel Water Softener units are available in mild steel option. Units are manufactures using mild steel pressure vessel, internal distribution and collection system, multiport or individual valves, piping, ventury for salt injection, salt tank, test kit etc. Aguapuro offers Stainless Steel Water Softeners in various sizes ranging from 200 ltrs/hr up to 500 m3/hr and above. These units are available in Stainless Steel option. Units are manufactures using stainless steel pressure vessel, internal distribution and collection system, multiport or individual valves, piping, ventury for salt injection, salt tank, test kit etc. These Softeners are available from 200 Mm dia up to 2000 mm Dia in Stainless steel construction, while for higher Flow Rates, same is available on custom design basis. Water produced using these Softeners is used widely in Industry and Commercial Sector. Aguapuro offers water softener in various sizes ranging from 200 ltrs/hr upto 500 m3/hr and above. 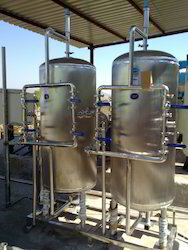 Water Softeners Automatic FRP units are available in stainless steel option. Units are manufactures using stainless steel pressure vessel, internal distribution and collection system, multiport or individual valves, piping, ventury for salt injection, salt tank, test kit etc. Systems are used in for various application which includes Cooling Tower make up water, Boiler Feed application, Process water for chemical Industry, etc. 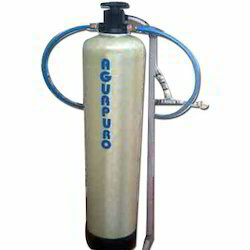 Aguapuro offers Mild Steel Water Softeners Auto in various sizes ranging from 200 ltrs/hr upto 900 m3/hr and above. These units are available in Mild Steel option. Units are manufactures using mild steel pressure vessel, internal distribution and collection system, piping, ventury for salt injection, salt tank, test kit etc. These softeners are available with auto multiport valves (either top or side mounted) or auto pneumatic actuated valve. We offers poly styrene di-vinyl benzene (Resin) of either Ion Exchange make or Lanxess male for better water quality. We offer high quality Domestic Water Conditioners. Industry as well as domestics can now eliminate pipeline scaling and prevent pipeline corrosion. Also get rid of build up algae, bacterial contamination within water cooling system and water loops with in water conditioner. A water conditioner is a non invasive and eco-friendly system that requires very small or say negligible energy.